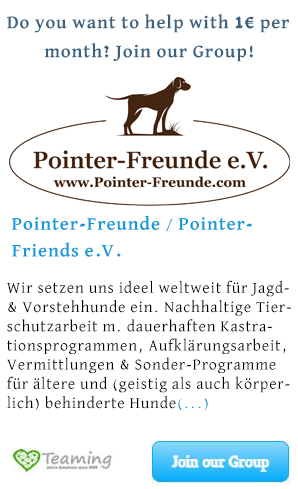 General diseases & Mediterranean diseases - Pointer-Freunde e.V. If you consider the adoption of a dog from abroad and research about it, you will inevitably repeatedly encounter terms such as ‘Mediterranean diseases’, ‘Travel diseases’, ‘Leishmaniasis’ or ‘Ehrlichiosis’. Even for experienced people in animal welfare, this is something that is incredibly difficult to understand. Every year new publications are published, in addition many testimonials from well-known and trusted organizations and animal-rights activists, and there are always people (dog owners, veterinarians, dog trainers, etc.) who think they have extensive knowledge of these topics. This way uncertainty often arises, because a dangerous half-knowledge is certainly not beneficial to deal with the subject objectively. We do not want to leave any risks unmentioned at this point or trivialize them, on the contrary. In fact, we support a particularly objective discussion on the topic of Mediterranean or travel illness. Diseases that occur especially in countries around the Mediterranean are colloquially known as the Mediterranean diseases. The term “Mediterranean disease” does not make sense for two reasons. On one hand, these diseases also occur in other subtropical and tropical areas, that`s why in veterinary medicine is often used the term “travel diseases”. On the other hand, some of these diseases are now also to be found in Central Europe. And here the problems with the research already start. Due to the effects of climate change we find some of the pathogens of the so-called “Mediterranean diseases” already in Germany or neighboring countries. Therefore, leishmaniasis and Filarial are included in the Mediterranean diseases. The Babesiosis and the Ehrlichiosis are long since not purely Mediterranean diseases anymore, because they have already crossed the Alps and are to be found in large parts of Europe, including Austria, Germany and Switzerland. Basically, with each adopted dog (also from Germany), you should think about whether you need a traveler profile set up for it and thus have it tested for travel illnesses. Germans like to travel a lot and therefore a dog from Germany on a trip to southern France, Italy, Spain, Greece etc… could make contact with the sand fly. This dog could also have leishmaniasis amongst other diseases. Certainly, the number of dogs suffering from a sickness abroad is higher – no question about it. Many dogs that arrive at an animal shelter are sick, undernourished or injured. The care and treatment measures cannot be compared with those in German animal shelters, where the animals handed over come mostly from private households. Serious animal-rights activists and animal welfare organizations that work (also) abroad, spend so much time, energy, money, and love, on these dogs to beef them up and if necessary to take care of their health. Not for nothing, most of the serious animal welfare organizations again and again go out of their way to ask for donations to take care of special emergencies and to bear the costs. Such emergencies are spontaneous and unannounced–they are not predictable. Also, the animal keepers require much physical and mental strength to cope with the daily tasks. The biggest and most beautiful target which we all daily work for, is to find a nice home and a loving family for our protégée. Knowingly to hide health deficits or diseases and risk that the dogs lose again their newly won and dear home, is not even conceivable by us. When it is finally the time that one of our dogs can leave, then it is not only brought to health (if necessary), but also it has gone through multiple basic immunization, parasite treatments, parasite prophylaxis and the necessary blood tests. The friends of pointer go through a lot of efforts in particular with regards to the veterinary care and treatment. We work together with veterinarians in Germany and abroad, who are contractually bound to us. Often we’d rather carry out one more treatment than one less. We also want to have the highest possible safety so that there is no risk for our rescued dogs, but also no risk for their new families and for us in the care places. Not to forget: many rescued dogs are taken into our home care, until they find their own home and therefore have not only contact with us but also with our dogs 24 hours a day. Should a dog actually have one of these Mediterranean diseases, we consider very carefully with our vets, which treatment for the dog makes sense and also what care. We have ourselves leishmaniasis positive dogs taken in with us and treated till “healthy” – they usually live a wonderful life for many years and an infection of other dogs or humans is so far not known. And if you have had experience with Mediterranean diseases, they often lose their terror. Please note that dogs under 10 months still cannot be fully tested not even through a blood test. The puppies could have gotten through breast milk antibodies from their mothers. This means the puppy would be tested positive without being infected or ill. These antibodies – transmitted by the mother – break down again in the course of the first year of life. Therefore, a more meaningful test with puppies and young dogs is at the earliest possible when they are 10-12 months old; this is why we recommend a retest after approx. one year. Basically, we always recommend having a talk with your veterinarian or healer. Discuss your worries and fears openly. Ask a person whom you trust, all the questions that you would like once again to be answered. Only remain here also “critical”, because even though it is hard to imagine in specialized vets or healers: They represent usually their own opinion, which is often not scientifically sound. That’s too bad, because especially international animal welfare is often frowned upon these days because of many black sheep and is therefore talked about badly. Therefore, form here also your own opinion and question the attitude of the one you ask for help & advice. Because there are many other examples of veterinarians, healers, homeopaths and dog trainers that have opted for a dog from abroad and have weighed the risks for themselves by checking the topic in detail.